I’m pretty much a control-freak nerd with antisocial tendencies and an aversion to physical exercise. Critical Mass involves joining 200 total strangers on a bicycle ride around London with no plan, no fixed route and no organisers… so I really have no idea why I enjoy it so much. But I do. It might be that whole snow-day thing, of witnessing a phenomenon that you couldn’t recreate no matter how hard you tried so you really, really try to absorb and remember as much detail as you can. Or it might be the sheer joy of cycling up Whitehall and down Oxford Street without wondering if you’re going to die horribly every time you go near a bus. 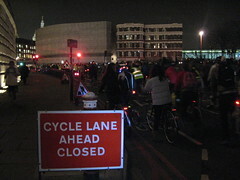 It’s the last Friday of every month, a whole crowd of cyclists appear under Waterloo Bridge by the BFI and cycle around London. It’s not a protest, it’s not organised, there’s no destination or agenda; it’s just a bunch of people who love cycling and happen to be following one another. Thing is, when the group of cyclists reaches a certain size (the “critical mass” they’re named after), the normal rules of cycling in London are turned upside down, and the traffic has to get out of your way for a change. The London rides have been happening since 1994, but I only found out about them last year. I’d been following the coverage of the legal dispute between the police and the cyclists about Critical Mass, which was eventually resolved in favour of the cyclists late last November. Two days later, I was in the café at Foyles bookstore on Charing Cross Road and saw the Critical Mass procession going past – two bikes with sound systems, a couple of unicyclists, a penny-farthing or two, and several hundred regular cyclists – and I just thought “yeah, I want to do that!” I went along to the next ride – which was Boxing Day, and absolutely freezing, but really good fun nonetheless – and tonight was my second ride. 15 miles or so, from Waterloo to Kings Cross, Euston, then along Hyde Park into Kensington and back through Knightsbridge. Every day, I try to ask myself “why will I remember today? What makes today stand out from all the others?” Well, today’s was cycling down Oxford Street, cyclists as far as the eye can see, shoppers applauding and cheering, AC/DC blasting out from the bike next to me… awesome. But don’t take my word for it – grab your bike and join us for the next one, wherever you are.